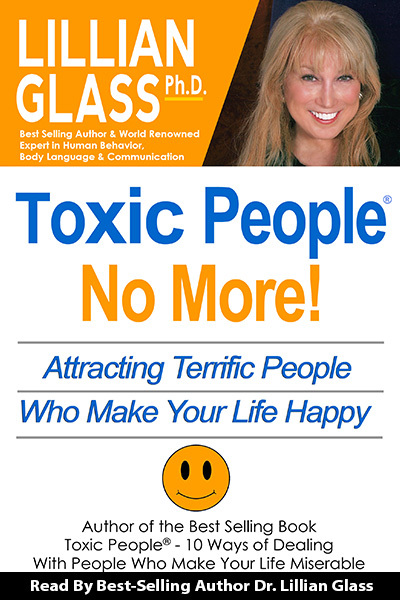 As part of her TOXIC PEOPLE® Audio series, Toxic People No More! helps you learn how to no longer attract TOXIC PEOPLE® in your life. In this 3 part series audio book Dr. Glass takes you from toxic to terrific! She teaches you how to be a terrific person, while filling your life with positive and encouraging people who bring you happiness, joy & help you pursue your life’s dreams. You will learn skills & techniques that teach you how to: discover new ways of communicating; overcome shyness & insecurity; reduce depression, boredom, & loneliness from your life; feel more comfortable taking risks with people; and how to easily recognize, attract, & maintain relationships with the the 20 Types of Terrific People who make your life happy. Finally, this book provides answers to the age old concern of how to attract more friends and influence people.